Would you like to improve your home security and make your life a little easier? You use your front door every day—why not start there? If you want to upgrade your locks, Kwikset has you covered, whether you need a basic, sturdy deadbolt or a lock you can control from your smartphone while you’re away from home. 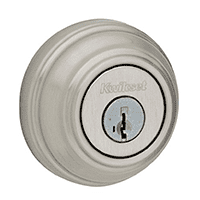 These locks are popular and well known, and we recommended Kwikset hardware in many of our other posts. Although we love that Kwikset offers tons of options, it can make it harder to find what you want. Fortunately, we’ve sorted through the options to save you time. Keep reading for more details about some of Kwikset’s best locks. The Kevo is Kwikset’s most advanced lock, and it comes with more features than the other locks on this list. If you’re looking for a serious upgrade, it’s Kwikset’s strongest offering. While there are other Kwikset locks with basic home automation features (discussed below), this is the only true smart lock on the list. The Kevo uses Bluetooth to connect to your smartphone so you can unlock your door by touching your phone to the lock—you don’t have to type in any codes, open any apps, or fumble in your bag for your keys. With Kevo Plus and the app you can lock and unlock the door remotely so you don’t have to panic if you forget to lock the door when you leave the house. You can also send eKeys to let someone in to walk your dog while you’re at work or water your plants while you’re on vacation. If you’d like, you can send scheduled keys so someone cleaning your home will have access during a certain window of time but not later in the day. The app also lets you see when those keys get used so you’ll know when someone enters your house—whether it’s your teenager getting home from school or your friend checking on your cat. 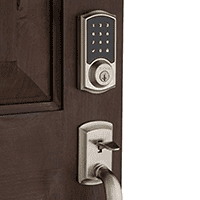 These locks have fewer features than the Kevo, but they come with either Zigbee or Z-Wave compatibility so they can connect to other home automation products. 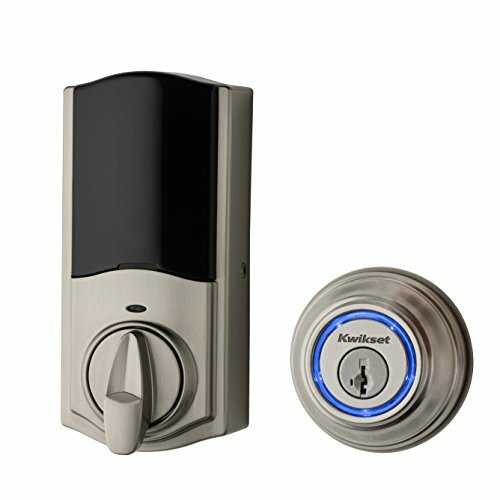 The 914 deadbolt has a physical keypad while the 916 has a touchscreen. The 916 even made our list of the best digital door locks. These locks have similar features and are in the same price range, so it’s up to you to decide if you prefer the physical keypad or the touchscreen. Not everyone can spend between $100 and $200 on fancy locks (especially if you need to secure multiple doors), but there are still great budget-friendly options that can improve your security. 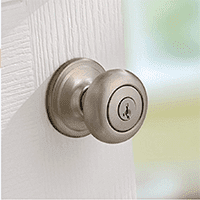 Kwikset offers normal deadbolts and doorknobs that still make your home more secure. 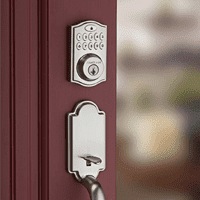 We like the 980 deadbolt and the 740 Juno doorknob because they’re sturdy, inexpensive, and attractive. These deadbolts and doorknobs don’t come with tons of fancy features, but they do come with Kwikset’s SmartKey tech that lets you rekey your own locks. If you want to upgrade all the exterior doors on your home without getting lots of different keys, this makes things much easier. Kwikset locks are certainly near the top of the pack, and we recommend them if you want to upgrade your security. Although we still recommend it, we should mention that the Kwikset Kevo is a little pricier than other smart locks like the August, so you may want to look at other options as well. If you don’t need a smart lock, Kwikset locks are hard to beat—they come with lifetime mechanical warranties, lots of finish options, and the easy rekey technology. Kwikset offers a solution for almost everyone whether you want a simple deadbolt, a lock you can control with your phone, or a lock that will always lock behind you when you leave the house. Have you upgraded the locks in your home? Share your advice and experiences in the comments below.